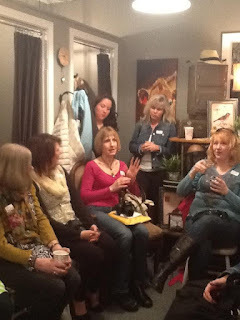 This past Saturday I attended the Midwest Meet-Up which was organized by the lovely and talented Jennifer Rizzo. We met for breakfast, which Mark Norkaitis so generously allowed us have in one of the rooms of his awesome shop, Room 363. It was such fun to finally meet the people behind some of my favorite blogs. There were women from Illinois, Wisconsin, Michigan and as far away as Kentucky! I even met one blogger that lives in the same town as me. Small world isn't it? Jen did a fabulous job organizing the event and everyone was so friendly and freely shared lots of good information. If you ever have the opportunity to attend a similar event in your area, be sure to take part in it. Just as we "meet" some wonderful people online in blog-land, a gathering like this gives you the chance to meet some of those same talented people in person. Yes it was so much fun! Looking forward to the next one for sure! What fun! you have a new look here, too! It is beautiful. I have been laid low with a dry socket after having a tooth pulled. Blah! Nice to meet you at the meet up. I like your Dream, Create, Inspire . . .